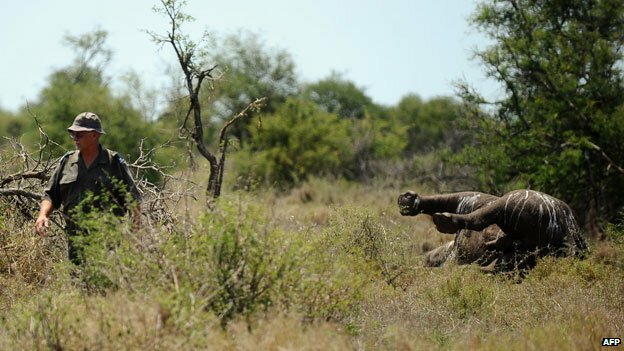 A South African rhino poacher has been sentenced to 77 years in prison in one of the heaviest sentences aimed at curbing the illegal trade. Mandla Chauke was arrested in the world famous Kruger National Park in 2011 for killing three rhino calves. He was also convicted for the murder of his accomplice who was killed in a shoot-out with rangers. Poachers killed a record 1,004 rhinos in South Africa in 2013, amid concern that the animal could become extinct. South Africa is home to 70% of the world’s rhinos. 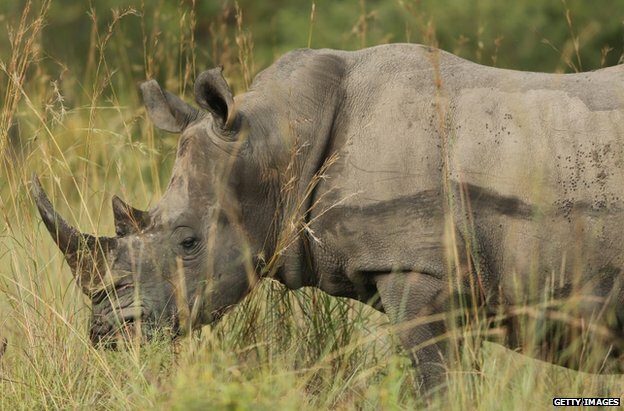 Chauke’s lengthy sentence, imposed by a magistrate’s court, was welcomed by South Africa’s national parks service as a “huge triumph for the rhino”. It gave a much-needed “boost to the anti-poaching teams who endure harsh conditions for the protection of our parks”, the parks service said in a statement. The court took the rare step of convicting Chauke for the murder of an accomplice who was shot dead by park rangers. It rejected his argument that he was coerced into poaching by his accomplices, one of whom escaped. Chauke was convicted of murder, rhino horn theft, illegal hunting, trespassing and illegal possession of firearms and ammunition. In 2012, a South African court sentenced a Thai national to 40 years in prison for selling rhino horns. Rhino horn sold illegally can fetch as much as $95,000 (£56,500) per kilo (2.2lb) – more than gold, according to the Bloomberg news agency. Large syndicates are involved in a multi-billion dollar trade worldwide, exporting the horns to both Asia and the Middle East.